Laser Genesis is a breakthrough laser treatment that stimulates the skin’s natural processes to reverse the signs of aging and sun damage. This medical-grade device helps promote a vibrant, healthy looking complexion. 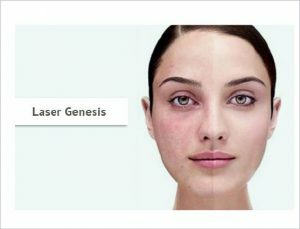 Suitable for all skin types, Laser Genesis can help improve pore size and the skin’s texture, and it can be used to reduce diffuse redness. Micro-pulses of laser energy safely heats the papillary and reticular dermis. In turn, this stimulates collagen production to improve fine lines and reduce scars. 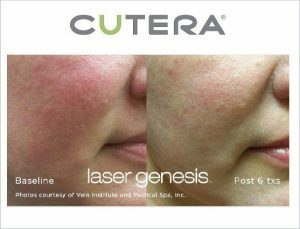 This treatment developed by Cutera® requires no downtime and involves minimal discomfort. A series of four to six treatments are recommended to achieve an optimal outcome and ongoing maintenance treatments are encouraged to sustain results. An extremely gentle procedure, Laser Genesis treats the skin conditions that concern you most, without bruising, swelling, or skin irritation. At the very most, you may experience slight redness in the treatment area that will disappear within a few hours. 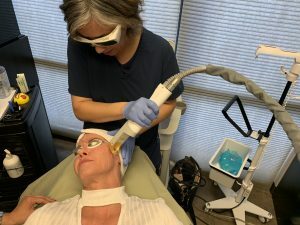 An extremely versatile procedure, Laser Genesis can effectively treat a wide range of skin imperfections, including fine lines, large pores, uneven skin texture, diffuse redness, and scars. Over the course of approximately five treatments, the Laser Genesis will gradually restore your skin’s youthful glow. When you look in the mirror, you’ll see a smooth and radiant complexion, as well as significant improvement in the appearance of fine lines, blemishes, and the size of your pores.